A rose in the snow! Where I live, we don't have snow. Thanks for showing another beautiful face of winter. Lovely shots. Mm, so beautiful and delicate.. Yes, they seem to thrive. Looks like you have the sme weather that we have. That light fluffy snow falling endlessly down. 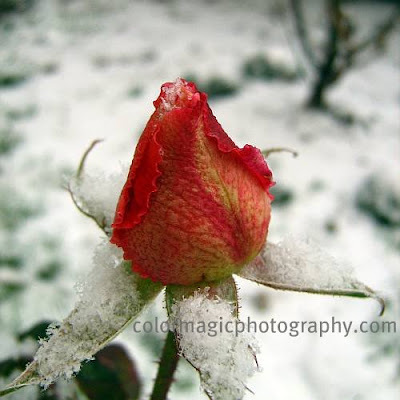 I can't believe you still have flower in the snow! They still survive during winter? amazingly beautiful photographs, I can see the fine details of the snow on the rose. Maia, that is just stunningly exquisite. That's really remarkable. 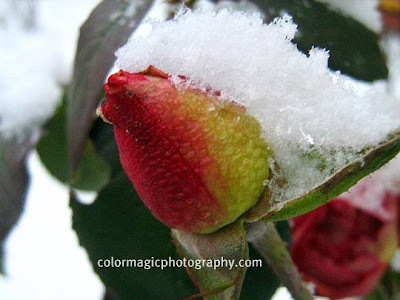 I've never seen roses take snow and cold like that. Can you find out the name and tell us? Maybe a local nursery knows what they are. In any case, they are gorgeous! 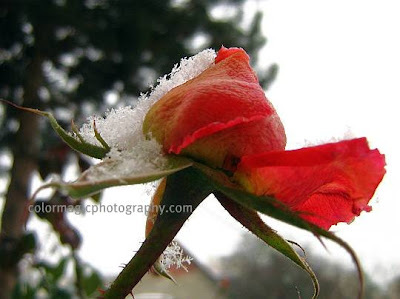 Wonderful that the rose with stand such weather. I will do some research to see if I can find some here. Though we don't have frost, the weather can be pretty harsh. I could try Sara, but I don't know where to start, there are thousands of species. 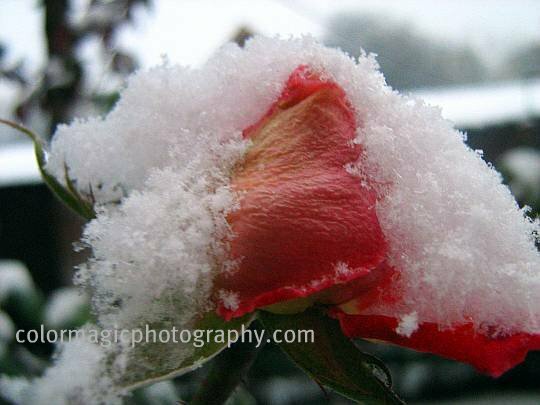 Beautiful rose in the snow! I saw a perfect snow flake in the first photo.. Yes Mumsy, I am very proud of that snowflake. I could never take a snowflake macro when I tried and now it just happened. What a TREAT! 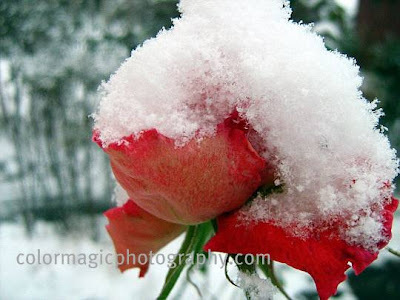 I love your snow covered flowers!!!! Oh, I just noticed a snow-covered benched behind the chrysanthemum - what a beautiful composition. The curve of the bench really adds another dimension to the flower image. What a great eye you have, Maia! Even when I expect it by following your blog for a long time, I am always impressed! Beautiful images. I miss the flowers. We do have a lot of freaky weather lately and the plants and animals are finding ways to thrive! Btw, you're right in saying that you can steal the energies of flowers when you touch them. Just as you can heal the flowers (plants, animals and people) with your touch! I'd like to think I do the latter. 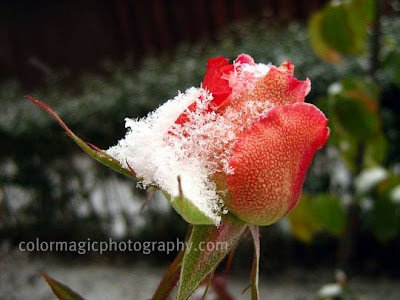 That rose is amazing, I can't believe it looks so beautiful under those conditions. Your fine snow reminds me of more than 35 years ago when i had my first winter in Canada. The snow was just lie the photo. The rose is really well kept. 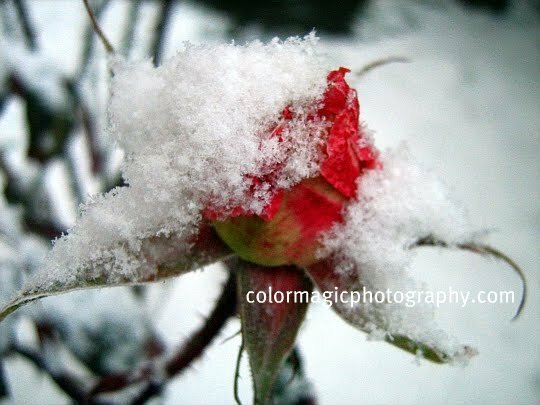 In fact, In Malaysia and Sinagpore, they could do with snow for wedding bouquets, some bride's roses become too opened because the weather is so hot.